Ever since I was a little girl, spiritualism/spirituality, the supernatural, mythology, fantasy, sci-fi, adventure stories and genres always seemed to be the thing that captivated me... the name I chose "the childlike empress" came from the movie, The Neverending Story, I always felt as if she lived in a world I always dreamed of... home. growing up an island girl, nature was my wonderland--and for a while, it was easy for me to see life through that type of lens... and believe me, life was not very kind or happy for me after my mother passed away when I was 6. I come from a highly creative and intelligent family--even in high school, I made jewelry, jewelry boxes and other forms of arts, crafts and fashion pieces... I used to sew a lot too! I even once sewed my own bikini from loose fabric scraps my grammy had saved up from the 60's and 70's!!! She was an incredible seamstress and a wonderful homemaker... I miss her dearly! I'm extremely sensitive, empathic and intuitive. I have been recovering, managing and self-healing from high anxiety, childhood PTSD, narcissistic abuse and other various invisible illnesses; including living with additional chronic physical discomfort/pain and exhaustion... I'm still a work in progress and I don't mind growing and expanding more and more every day. I always wanted to creatively express and share the things I felt and saw forming in my heart and mind. I've always been inventive and Nikola Tesla is an inspiration, master teacher/guide and soulmate of mine... so his codes, consciousness, galactic technologies, etc connect through me as I'm crafting each unique piece... because I craft orgonites and I also electroform my items, the process can sometimes take days up to weeks to complete. I descend from many very deep and magical ancestral lineages. Most reading this will have been introduced to this line, because of my coaching/spiritual work... for those who are not familiar with me especially, I am a natural born intuitive, empath, healer and medicine person. I actively work with my ancestors as well as the sacred light earth realms, angels, ascended masters, Creator, Gaia and many more significant and special soul family... basically--A LOT OF JUJU GOES INTO THESE PIECES... These are NOT ordinary jewelry pieces--they are HIGHLY ACTIVE energy healing pieces that WILL activate and clear your energy field; shield and buffer against EMFs AND catalyze major changes in your life especially. WITH LOVE: PLEASE DO NOT CONSIDER PURCHASING ONE OF MY MORE INTRICATE PIECES ESPECIALLY UNLESS YOU ARE ALREADY WORKING ON SELF-HEALING OR ARE OPENING UP TO DOING SO... IT IS PURPOSED TO ACTIVATE HIGH ENERGIES, CATALYZING INTENSE LIFE CHANGES AND SHIFTS. I'm very lovingly attached to my work, as any artist might be. I see each and every single one of them as personal extensions and reflections of me... I see them as my children, I know it sounds crazy but that's also part of the reason it may take a moment for me to really want to let some of them go. I am definitely creating with the intent to share and release to the world though, so if something seriously speaks to you... please don't be shy. my in my butterfly princess cape and gown... the most amazing outfit I have every owned in my entire life--hairclips, mini tank-top and all! 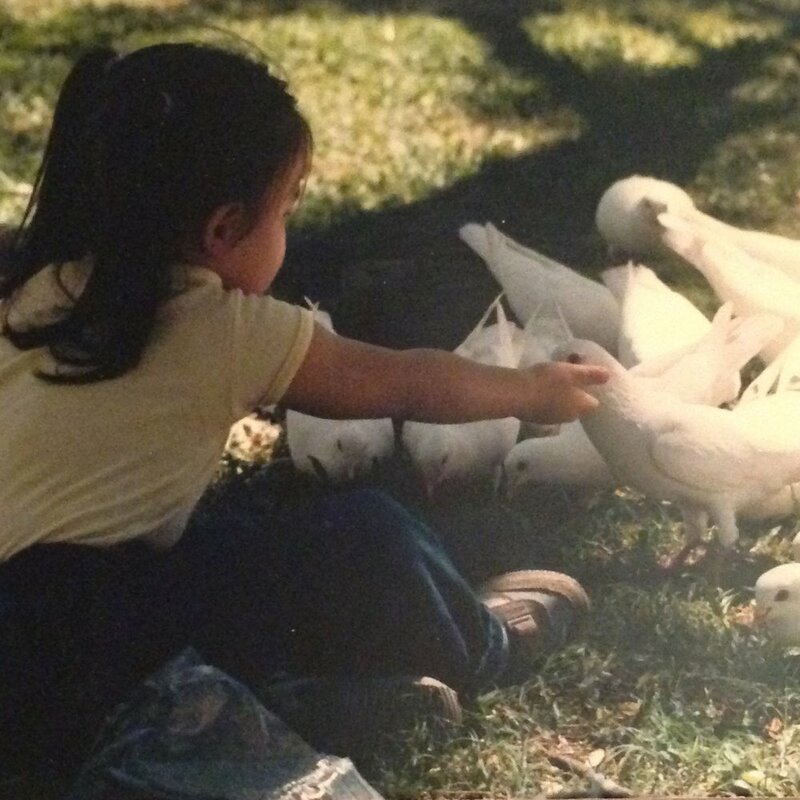 just me, hand-feeding some birds... good friends, good times.